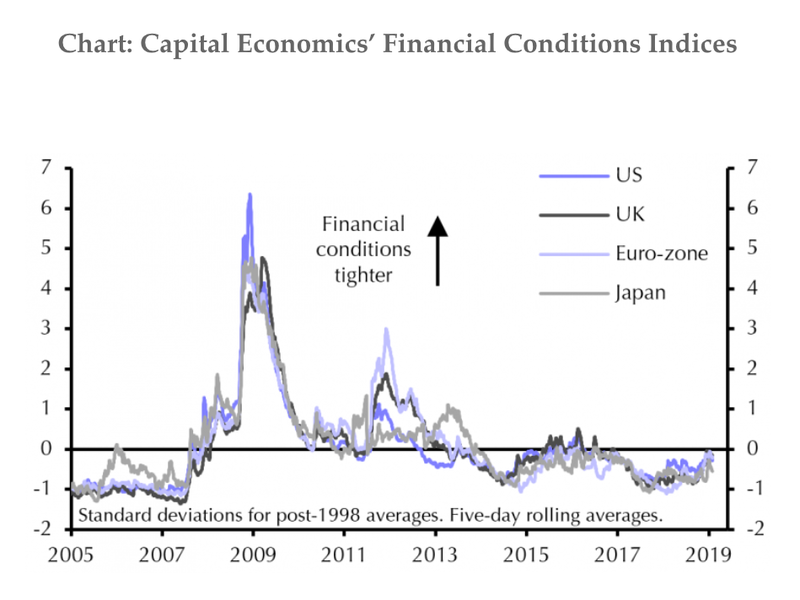 In a blog titled ‚If you only watch one chart, make sure its this one,‘ Shearling argues that financial conditions indicators, which a heap of macro variables such as interest rates, credit spreads, stock prices, and currency levels, are key for forecasting the future. First, financial conditions indices (FCIs) across all the world’s major economies tend to move in sync. This is particularly true with the US and Europe, Shearling adds. „It’s rare that financial conditions in one major economy tighten without there being a similar tightening in the others,“ he writes. Secondly, if financial conditions tighten sharply, it tends to indicate a coming slowdown, meaning that there is no need to focus on a specific level for the indicator. „We should therefore put more emphasis on changes in our financial conditions indicators rather than their level,“ Shearling said. „What happens to financial conditions next will have a significant bearing on the prospects for economic growth this year,“ Shearling continues. „If the recent stabilization is a sign of things to come then it becomes easier to believe that the weakness in the latest economic data will be a flash in the pan. „By contrast, if financial conditions start to tighten once again (and our sense is that they probably will) then we’re likely to feel the consequences in terms of a further slowdown in growth over the coming quarters.